Filter Concept is keen to deliver highest level of quality product to their customer & with endeavor to that; FCPL has introduced Disc Filters to cater demanding application of various Water and Waste Water with Irrigation requirements. They are very useful for applications where suspended solid load is comparatively high and they have to cater a high flow rate. Auto clean disc filter works on the principal of pressure difference. Auto clean disc filter is a design of filter, in which during required cleaning phase, the outlet flow itself works as cleaning medium. The no. of discs are arranged within supportive core as element. They are compressed with arrangement of a rubber spring from top side. Two positioned three way ball valves are used at inlet of disc filter system. This valve connects inlet and drain of designed disc filter. At the startup of operation, inlet valve and outlet line are being opened. The flow of fluid enters through inlet, passes through the outer surface of discs from flow direction outside to inside. The debris are being collected in grooves of discs. The filtered fluid comes out trough inner surface of filter discs. Because of collection of debris on outer surface of disc, the pressure difference is achieved to some value. When the system reaches to specific set differential pressure value, the system comes to back washing stage. When the system reaches to a set differential pressure value, the PLC starts to work. The inlet valve is getting closed at system inlet side and being opened at drain port side. Because of presence of diaphragm valve at bottom side of disc filter arrangement, diaphragm valve closes the flow direction from outside to inside of filter discs. Now, the back wash flow from the outlet comes to inner surface of filter disc arrangement. This flow creates pressure on rubber spring, so that it tightens the spring in top direction and filter discs get loosen. This back wash flow generates centrifugal helical effect so the flow squirts out in tangential direction to discs arrangement, which separates and cleans the discs evenly. The debris are being drain out through drain port of system. After the cleaning of discs, the inlet port has been opened and drain port getting closed. Flow direction changes from outside to inside of disc arrangement and discs are pressed again with the help of rubber spring compression. The filter starts filtration. The filter units come across back washing one by one. When one system is under cleaning, other systems remain in filtration mode. Filtration is not being effected during back washing period. Compact design compare to flow requirement. System takes 5 to 18 seconds to complete the back wash process. Can work with organic impurities. 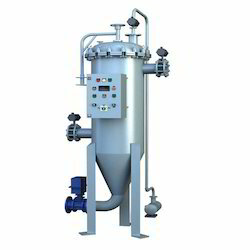 Can be useful for filtration of viscous impurities as well. 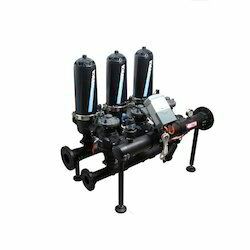 Self cleaning filter is constructed of filter housing, filter element, back flushing valve, differential pressure gauge, differential pressure switch, Dust Extraction assembly,Geared motor with Sensor and Control Panel. Filter housing can be offered in various material of construction such as various grades of stainless steel, carbon steel and alloy metal. Filter element can be offered in wedge wire, multi layered wire mesh, and plain wiremesh configuration, depending upon process requirement. These filters can offer filtration level starting from 1 micron to 2000 micron. They are designed to deliver flow rate up to 2000 m3/hr or even more than that with parallel configuration. 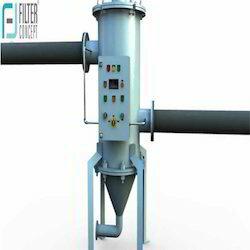 Filter element cleaning mechanism constructed of dust extraction assembly, which rotates inside the surface of filter element &moves upward downward to ensure proper cleaning of filter element throughout the area. 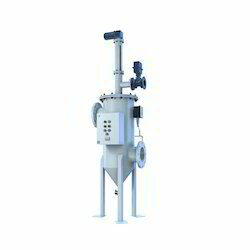 Dust extraction assembly is constructed of precisely designed nozzles at predefined distance from filter element surface. Such nozzles are equally placed perpendicular with center pipe, which rotates with the help of geared motor at defined speed. Dust extraction assembly is also connected with back flush valve that has finally open end to the atmosphere. Once differential pressure reaches to its pre set level, control panel send signal to back flushing valve to open. With pressure difference within filter element & atmospheric pressure outside, it creates high suction inside the filter element. Due to this suction pressure, debris/cake deposited on element surface is pulled out through nozzles & finally discharge from filter housing through flushing line. With high velocity of water within nozzle create a jet pressure to remove sticky cake deposition even with small opening. This entire process of back flushing completed within 30 – 60 seconds depends upon size of filter element. 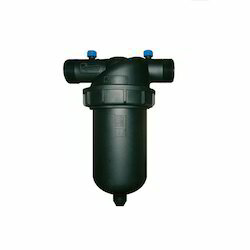 Looking for Self Cleaning Filter ?